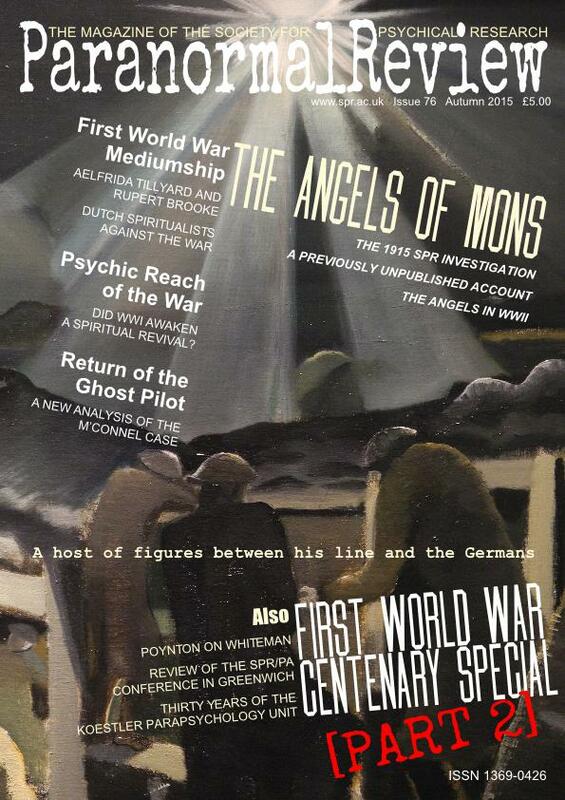 Paul Nash’s Ypres Salient at Night (1918) adorns this issue’s cover. To me, the ghostly flare seems to suggest the possibility of angels, but I have used the text to draw the eye to the black spaces of No Man’s Land where their reality ultimately faltered, an absence highlighted by the use of the quotation. The helmets of the frontline soldiers blend with the hummocks created by artillery barrage in a pummelled landscape that seems to draw no differentiation between the living, the dead and the mud. Some of the First World War commemorations may now be over, but one hundred years ago, the war itself was not. In 1914 people believed that it would be over by Christmas. By 1915 they realized that it would not. And 1915 is a particular commemoration for the Society for Psychical Research. It was in this year that the Society’s Assistant Research Officer, Helen Salter née Verrall, investigated and reported on the Angels of Mons. At the end of 2014, the SPR’s Research Grants Committee generously awarded me funds to pursue research on the subject of ‘The SPR at War’. In early 2015, I was able to conduct research in the SPR Archives in Cambridge and discovered a wealth of new material. ‘Mrs Salter and the Angels’ and ‘A Previously Unpublished Account of the Angels of Mons’ are the early fruits of this work. Additional findings were presented at the SPR Study Day ‘Raiders of the Lost Archives’ in London on 24 October 2015. Incredibably, a member of the audience came up to me afterwards to say that her great uncle had claimed to have seen the Angels, too. During my research on the Angels and Helen Verrall, in particular, I came across the name of Sheila Mann. She had just written her magnum opus, Hints of a Perfect Splendour, the biography of Helen’s friend Aelfrida Tillyard. I was delighted when she agreed to write an article describing Aelfrida’s mediumistic experiences that included purported communications from Rupert Brooke and other soldiers, as well as the SPR’s Frederic Myers and even Helen’s mother, Margaret Verrall. Dr David Clarke, known for his book-length treatment of the Angels legend, takes the story further, looking at the Angels and other legends of supernatural intervention during the Second World War, aptly for the 75th anniversary of the Battle of Britain. Dr Carlos Alvarado found time in his busy schedule to write about Hereward Carrington’s book Psychical Phenomena and the War. Another participant at the ‘Raiders of the Lost Archives’ Study Day, Iris van der Knaap, contributes an insightful look into Dutch Spiritualism during WWI. Whilst the Netherlands remained neutral, the country was not unaffected by the conflict and many were moved, sometimes by the spirits (allegedly), to speak out against it. I am also delighted to welcome Robert Charman back to these pages with his thorough analysis of the famous M’Connel case. Overall, I am pleased to be able to include in this second instalment of my First World War Centenerary series a broad range of new research that presents some important findings. The highlight of this year, so far, was the joint SPR and Parapsychological Association conference in Greenwich in July. For those of you who could not attend, I have written a review, including an account of a rather impromptu psychical experiment. Conference is such a tremendous opportunity to stay current with the latest research, shake some famous hands and meet up with old friends. I only wish that more would take advantage of it. A centre-point of the conference was the moving tribute to Bob Morris by his former friends and colleagues. The creation and continued existence of the Koestler Parapsychology Unit at Edinburgh University owes much to his genius, leadership and tenacity. Now celebrating thirty years at the forefront of research, Dr Caroline Watt talks us through its history and highpoints. Brandon Hodge joins us with an exciting denouement to the adventure that started last issue: the discovery of the Spiritual Machine, or plans for it, at least. Sadly, it is also another clarion call for more care and attention to be paid to the priceless archives of psychical research. Prof. John Poynton asks us to reconsider the overlooked genius of Michael Whiteman. In 1915 the Assistant Research Officer of the SPR conducted an investigation into the Angels of Mons. Dr Leo Ruickbie uncovers new material from the archives on the enquiry and those who took part in it. Dr Leo Ruickbie analyses a previously unpublished account of the Angels of Mons. Dr David Clarke looks at the Angels of Mons and other supernatural saviours during World War II. During the First World War, Aelfrida Tillyard claimed to be in contact with soldiers and members of the SPR from the Other Side. Sheila Mann tells her story. Dr Carlos Alvarado reconsiders Hereward Carrington’s Psychical Phenomena and the War. Iris van der Knaap looks at the role of Dutch Spiritualists during the First World War. Did pilot David M’Connel communicate with James Larkin at the time of his death on 7 December 1918? Robert Charman analyses the evidence. Dr Leo Ruickbie reviews this year’s joint conference of the Society for Psychical Research and the Parapsychological Association in Greenwich. Dr Caroline Watt looks back at the last thirty amazing years at the Koestler Parapsychology Unit in Edinburgh. In the final part of his search for the famous spirit room of Jonathan Koons, Brandon Hodge discovers the ‘Spiritual Machine’. Discussion continues of Kai Mügge’s mediumship. Exclusive discount for Paranormal Review readers on Spirit Possession Around the World.